It’s taco night, and it’s your turn to cook. Gluten-free is trendy, but it’s also healthy. Healthy gluten-free tortillas or wraps can help liven up any taco Tuesday. Although corn is naturally gluten-free, some store-bought hard and soft shells still contain gluten. An ingredient in the flour tortillas for one popular taco shell company is wheat flour, which is definitely not gluten-free. There is also dough conditioner with wheat starch. Store-bought tortillas also likely contain genetically modified corn unless otherwise specified. In fact, 92% of the corn on the market is a GMO, according to the Food and Drug Administration. Bacillus thuringiensis (Bt) toxin is a spray often used on GMO corn that can damage the intestines and create allergy symptoms, such as headaches, depression, and hyperactivity. There are people allergic or sensitive to corn. Maybe you suffer from allergy symptoms unknowingly. Allergies will cause the immune system to create antibodies that trigger the release of histamines and other chemicals. Many store-bought taco shells also contain a laundry list of food additives and preservatives. Some of these include potassium sorbate, calcium propionate, partially hydrogenated soybean oil, glycerin, palm oil, l-cysteine hydrochloride, and the preservative TBHQ. These food additives and preservatives can negatively impact the digestive and immune systems and contribute to disease. Luckily, you can make your own tortillas or wraps without any guilt or potentially harmful added substances. Let’s take a look at four creative gluten-free options for tortillas/wraps that can certainly become an instant success during any taco night. Cauliflower is a great envelope for your favorite ingredients. It is not only high in fiber, but it is also rich in several micronutrients like vitamin C, vitamin K, folate, vitamin B6, and manganese. The following recipe will make about six tortillas, and come out solid enough to hold a lot of filling. It is also a healthy paleo option because it is nut-free as well. Using a food processor, pulse the cauliflower until you get a texture finer than rice, and steam the cauliflower for about five minutes until it is soft. Place the steamed cauliflower in a dishtowel, and squeeze out as much excess water as possible. It is a good idea to let it cool for a few minutes so you don’t burn yourself. Try to get as much water out as you can, or you’ll get soggy tortillas later on. Transfer the cauliflower to a bowl, and add the oregano, paprika, eggs, salt, pepper, and other preferred spices. Make six balls of equal size, and spread each ball on a baking sheet lined with parchment paper. Make six small circles with the balls. You may need two baking sheets. Place the baking sheet in the oven and bake for eight to 10 minutes; then, flip the tortillas carefully and cook for another five minutes. When ready to serve, reheat in a pan at low heat. Zucchini, or summer squash, is another versatile vegetable that can be transformed into a tortilla shell. Zucchini is also very nutrient-dense with lots of fiber, manganese, and vitamin C. Although the final product will be a little harder than the cauliflower tortillas, the zucchini tortillas will fold into the perfect container for any favorite ingredient. I like adding guacamole with juice from a lime, sautéed spinach, green onion, and sliced grape tomatoes. Wash and grate the zucchini. Squeeze the water from the zucchini, and place it in a medium bowl while discarding the zucchini juice. Add the arrowroot flour, coconut flour, spices, and eggs, and mix until well combined. Line a large baking sheet with parchment paper. Create small 6 cm. 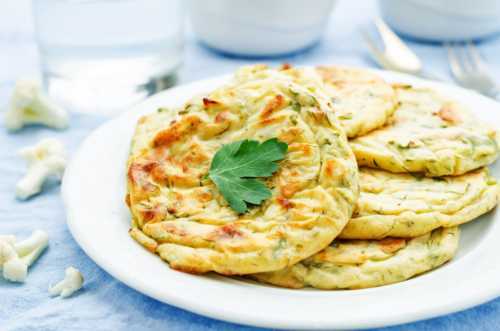 balls of zucchini mixture, and spread them out to create thin round-shaped tortillas. Bake for 40 minutes or until the tortillas are golden brown. Serve with your favorite toppings. Flaxseeds are a great source of lignans, which may help balance hormones. They are also a good source of omega-3 fatty acids, fiber, and manganese. Flaxseeds are great for digestive health and may also promote heart health as some research shows they could reduce the risk of heart disease. The following flax recipe makes for six wraps that are be used for your choice of ingredients. Try a pesto spread, spinach, cucumber, shredded carrots, and sprouts. Using a coffee grinder, grind the flaxseeds. Transfer ground flaxseeds to a bowl, add the water, and mix well. Set aside. In a food processor, combine all of the ingredients except for the grated carrots, and add the flax mixture. Process until smooth, occasionally stopping to scrape down the sides of the work bowl. Add the grated carrots and pulse just a few times so the carrots maintain their texture. Preheat the oven to 150 F or dehydrator to 125 F. Line a few baking sheets or dehydrator trays with parchment paper. With moist hands, spread a half-cup of the mixture as evenly as possible in a circular motion until it as thin as a tortilla. Repeat with rest of the mixture. You should get about six tortillas/wraps. Bake in the oven for five to seven hours (or dehydrate for five to eight hours), flipping halfway through to ensure even drying. If you go too long without checking, the tortillas may lose pliability and resemble a cracker. There is some variation in cooking time because every oven is different. Remove from the oven, and let the tortilla wraps cool for 20 minutes. Place the wraps in a resealable bag so they stay moist and soft. It will keep for one week in a sealed bag in the fridge or up to four months in the freezer. The final tortilla recipe uses a combination of brown rice flour and buckwheat flour. Both nutrient-dense ingredients are perfect for those with gluten sensitivities. Buckwheat and brown rice flour both contain manganese, magnesium, and tryptophan. Both gluten-free grains also promote heart health and better sleep. Try the gluten-free rice and buckwheat tortillas below. Optional: For a cheesy flavor add two tablespoons of nutritional yeast to the dough. If you like it a little spicy, add one teaspoon of cayenne pepper to the dough. Also, one teaspoon of salt can help enhance the flavor. Put the flours into a large bowl. While stirring, slowly add a cup of warm water and the apple cider vinegar. When combined, stir in flax meal to form a dough. If you need more water, add one teaspoon at a time. Once well mixed, knead the dough for two minutes, until it feels tougher. Form into a ball. Roll out the ball of dough with a rolling pin, and make six 6-inch circles that are about a quarter-inch thick. Heat a cast-iron pan on medium heat on the stove. When hot, place the flat bread in it, and cover the pan while it cooks. Cook for about a minute on each side, or until the dough it no longer soft to the touch. There should not be any soft dough anywhere on the tortillas. Set them aside as each tortilla finishes. Once the tortilla is ready, transfer to a plate and cover with a clean dishtowel or cotton napkin to keep it soft. It is best to eat them the day of preparation. Didn’t think taco night could get any more delicious? Cauliflower, zucchini, brown rice flour, buckwheat flour, and flaxseed all make great complements to great tasting tortillas or wraps without the added chemicals or questionable ingredients. The recipes can also be a base for a pizza, or sliced into strips for dipping into cashew cheese, tahini, hummus, salsa, or guacamole. Although the healthy gluten-free tortilla and wrap recipes provided taste great, they also increase your time in the kitchen. To save some time, try using large romaine lettuce leaves, Swiss chard leaves, or other leafy green that makes a convenient container for your favorite taco ingredients. And, remember that taco night can be fun and healthy! With healthy gluten-free tortillas recipes, you can feel good making taco night any night of the week. Daniluk, J., “Hot Detox: A 21-Day Anti-Inflammatory Program to Heal Your Gut and Cleanse Your Body (Toronto: HarperCollins Publishers Ltd., 2016), 224-225. Werner-Gray, L., 10-Minute Recipes: Fast Food, Clean Ingredients, Natural Health (Australia: Hay House Australia, 2016), 215. “Cauliflower Tortillas,” PaleoLeap; http://paleoleap.com/cauliflower-tortillas/, last accessed February 6, 2017. “Health Risks,” Institute for Responsible Technology; http://responsibletechnology.org/gmo-education/health-risks/, last accessed February 6, 2017. North, C., “How Can Corn Affect Our Bodies?” LIVESTRONG; http://www.livestrong.com/article/509431-how-can-corn-affect-our-bodies/, last updated Dec. 13, 2015. Mateljan, G., The World’s Healthiest Foods: Essential Guide for the healthiest way of eating (Seattle: George Mateljan Foundation, 2007), 184, 196, 512, 676, 686. “Zucchini Tortillas Recipes,” Dr. Axe; https://draxe.com/recipe/zucchini-tortillas/, last accessed February 6, 2017.